Are we looking at the Depot steps in this picture? A closer look: are they steps or, possibly, a fence? Just below the railroad platform, it seems like we might see light, possibly sunshine on railroad ties. The tracks ran west of the Depot, and so are behind the depot building. The railroad’s right-of-way ended just to the west of the tracks, and that is where the Minnehaha Midway began. A nice modern shot of the Depot, taken just west of the tracks, and facing northeast. It’s showing the other side of the depot from the historic picture. This was taken by architectural historian Richard Kronick, and is used with his kind permission. This platform is clearly brick, and it is not six steps up from the ground on the east side. The urbancreek.com research team is fully capable of mistaking the Princess Depot in photographs but is certain that this is not one of those times. 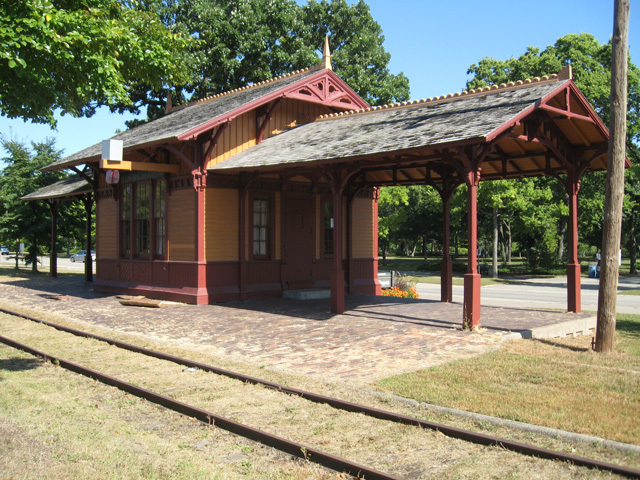 A clear picture of the Princess Depot and her relationship to Minnehaha Avenue. In this picture, the tracks are behind the building; we are looking west. 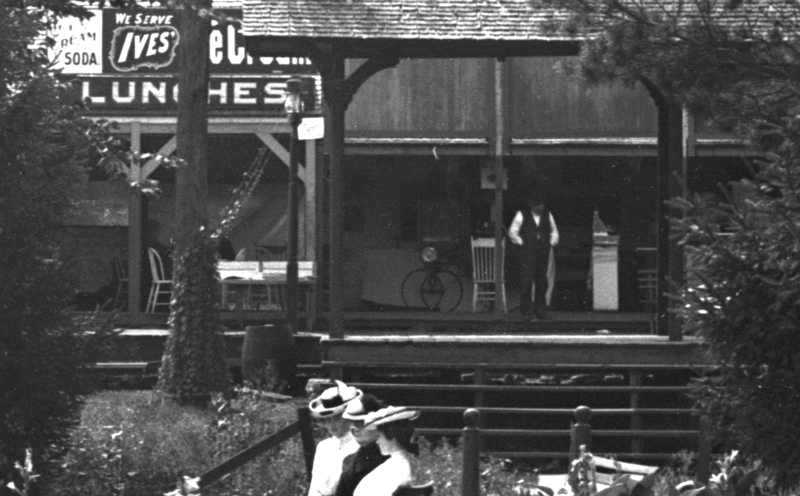 If those pavilions were still there, that wall behind the Depot would run right in front of them. Today the Depot is obviously at grade. 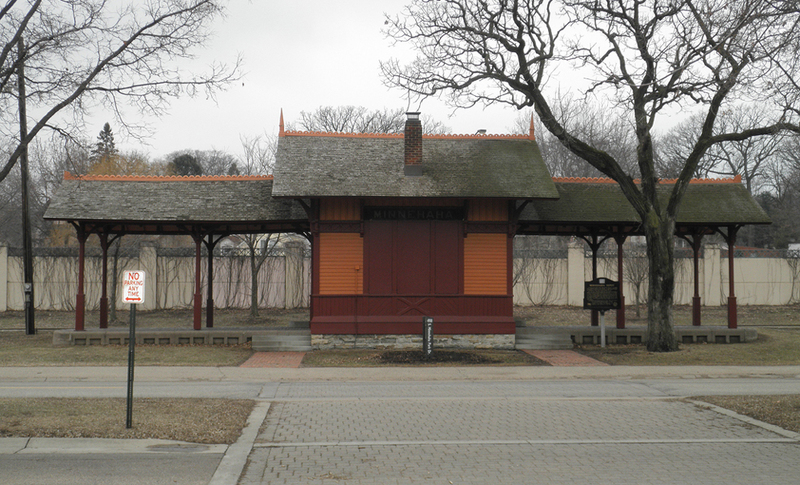 This photo was taken on April 8, 2013 by Tony Held, who volunteered at the historic Minnehaha Depot in the late 1990s. The photo is used with his kind permission. 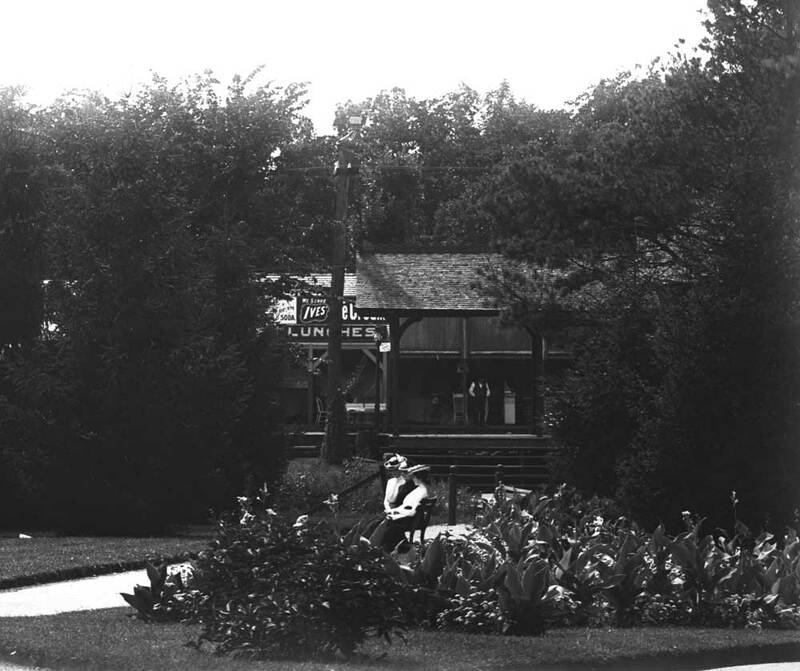 Back in the early 20th century, there was a road-paving and improvement project on Minnehaha Avenue, and it’s possible that the grade around the Depot was brought up 4 feet or so. There’s no evidence to date of this sort of gigantic road-building project, but one supposes that could explain this early Depot photograph. It’s so nice to have a fresh mystery to ponder!